Two media articles about technology in the classroom yesterday. “Does More Tech in the Classroom Help Kids Learn?” from Mashable lays out simple, but poignant arguments about how technology in the classroom can add to student achievement. Simple things like letting kids learn at their own pace, promoting active rather than passive learning, and real world learning are things that should happen anyway – it’s just that technology finally allows them to happen easily. It’s a good quick article, and I’ll be keeping it in my list of articles I send administrators and teachers to. An article, “Schools See a Tech Revolution but will Students See Results?” in the St. Paul Pioneer Press is, of course, more skeptical. The newspapers always are. The article starts out with the premise that tech is expensive, and only focuses on that. It treats is as a fad, and of course, measures all results based on standardized test scores. Getting that to change as the only measure of success is a whole different ballgame, but it certainly obscures the other positive outcomes. I do find it interesting that St. Paul schools have been working on this for over a year. I have a coworker whose son attends a St. Paul school. She’s been asking for a couple of years about St. Paul’s plan, and has heard nothing. Which is St. Paul’s loss, as she could be a huge asset to them in this planning. The article does have some strong arguments for positives, such as a quote from Peter Beck, a high school history teacher: “More and more, we’re facilitating learning rather than being the ultimate keepers of information and knowledge.” The tech director for Edina is also strongly stating that we can’t stop while we wait for evidence through tests. It’s obvious the paper and the general public hasn’t embraced this paradigm shift yet. Just the tone of this article makes it clear that they don’t approve. I’ve been attending a large museum conference all week. I presented earlier in the week about my project on how museums teach 21st century skills — but more on that in a separate post. I attended a session today about how to present technology issues to your board. The session was of interest because we often have to explain to people (boards and others) about technology budget requests, why we want to move to a new system, etc. I knew or knew of a number of the presenters, and I knew it would be an interesting and provocative session. The presenter that talked about this concept related a story about a project he proposed once. The group he proposed it to dismissed it immediately, without any discussion or thought. Four years later, that same group proposed the exact same concept and it passed readily! He related this to planting the seed, tending the garden and making it a rich environment in which these ideas grow. This seems to be my experience working with the schools my kids attend. For the last year, I have been knocking at their doors, asking questions, suggesting ideas, and generally letting them know I think they need to pay more attention to technology and 21st century learning. It has been frustrating, as I’ve stated in past blog posts. Often, they are too busy to talk. They are dismissive, as if I’m just another annoying parent with issues. They infer that they are the educators, thus know more than I do about this. Or, there is no way I, as a parent, could possibly know what it is like in the classroom. I offer to volunteer, to train, to help out — and I am turned away. And more. It’s been frustrating. However, I have to admit — I see signs of the seeds taking hold, and maybe starting to sprout. One school rolled out Google Apps for the students fairly quickly. At another place, an administrator asked to meet with me about my work. Like the presenter today, I have to give it time. As he said, the time between his idea and the adoption was long, but he worked to make people understand his idea — slowly, one step at a time. He was far ahead of them the first time. They needed time to catch up. While I want the schools to move faster, I have to realize that they have other issues to deal with, and they need to get their thinking to the point where they see the advantages of moving ahead — and disadvantages of the current set-up. They have to be at a point where staying put is no longer an option, where it’s not a threat when their day-to-day work needs to change. Planting a seed. Maybe if I have that as my goal, rather than full-blown tech integration and teaching of 21st century skills, I’ll feel more successful. Maybe there’s hope. I just hope it doesn’t take four years. Today was the first day of the standardize testing season at our house. My daughter is a high school freshman. She had to take the GRAD test for writing this morning. Fortunately, she doesn’t get stressed about these tests. I hope she takes it seriously enough to pass, but that’s about it. She said there were a number of kids in her group who didn’t speak much English. 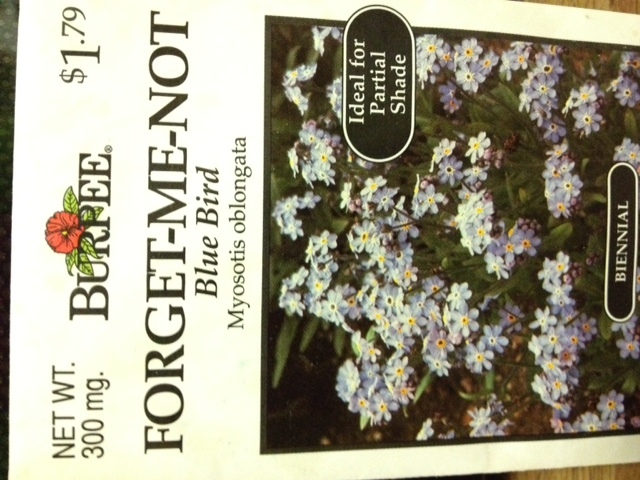 (The school has a large refuge population.) They were taken out of the room in order to have the directions explained, then came back in to complete the test. The test involved them writing an essay to incoming high school freshman about their high school experience. I find this crazy. These poor kids, who don’t speak enough English to understand the directions, are expected to write an essay like this? What does that do to them? How do they feel getting that failing grade back? What a waste of their time. If someone can tell me a good reason to make these kids do this test, please let me know. What perversely minded educator though it would be a good idea to make kids who can’t speak English yet write an essay for the MCAs? This is the 21st century! The conversation on Twitter about this post drew in the big names in this field, and the conversation was lively. I am grateful to Mr. Richardson for taking the big step. We seriously considered opting my daughter out of tests last year, but I didn’t have the guts to do it. (Then again, I’m not Will Richardson with a huge education reform audience!) But he has given me the courage to move forward. Unfortunately, my daughter is at the point where these tests are required for graduation, so I’m not sure we have the option to opt out at this point. I need to make some stand about this, I’m just not sure how. Now I find out there are many people choosing to opt out. I wish I had known that last year! Here are a couple more blog posts about opting out. Go for it! Interesting blog post from The Fischbowl about getting parents involved. He’s following up on a post he saw on Will Richardson’s blog where a superintendent talks about needing to engage parents in the conversations. I have to say that that my experience at my kids’ schools has been the opposite: I’ve been kept at arms length. I’ve been trying hard to respectfully engage school leaders in conversation about 21st century skills, including integrating technology, allowing students more flexibility in assignments and learning opportunities, empowering students using the tools they use 18/7 (outside the school day),etc. I have never been rudely shut out, but I certainly haven’t been taken seriously or given more than cursory answers. Usually, I am treated as one more complaining parent with smiles, but that vacant look that tells me they are really thinking about something else while we’re talking. I’m not sure what I’m doing that is getting the door gently shut in my face. It is a totally different story when I approach schools as a part of my work. I have talked to school superintendents, technology directors, teachers, curriculum directors. I have been welcomed into their schools, classrooms, conferences and conversations. We have engaged in serious, thoughtful conversation about the same topics: 21st century skills, technology integration, digital literacy and responsibility, flexibility, testing (amazing how they universally dislike testing!). The conversations have been energetic (watch for flying coffee! ), passionate, and invigorating for all involved. We mutually bemoan the fact that there is little quantitative data about success, yet the observed and anecdotal data is overwhelming. Not that this is about me, but in those settings, I am treated professionally; my thoughts, opinions and work is treated professionally and taken seriously. We are partners. Why aren’t I taken seriously when I approach the schools as a parent? Am I a threat? Am I complaining? I admit I am complaining when my daughter can’t use her iPhone graphing calculator. I only want what’s best for the kids — and not just my kids. I see such overwhelming success in the schools I visit that are ahead of the curve: those that incorporate 21st century skills, those that have thoughtfully integrated technology into all classes. I started out just asking what the schools are doing about these topics. It is no secret I think they need to do more, but I have tried to offer support for whatever steps they are taking. My offers to help have for the most part (with a few notable exceptions) been ignored. To get back to my main point: I’d like to be engaged by my child’s schools. I will be your strongest advocate and supporter. I know this is a big step, and I applaud and support all the steps you’re taking. I’ve got your back. I’ll do whatever I can to help, and I do know what I’m doing — even if I’m not currently teaching in a classroom. Please don’t shut me out. I’m on vacation in sunny Palm Springs. 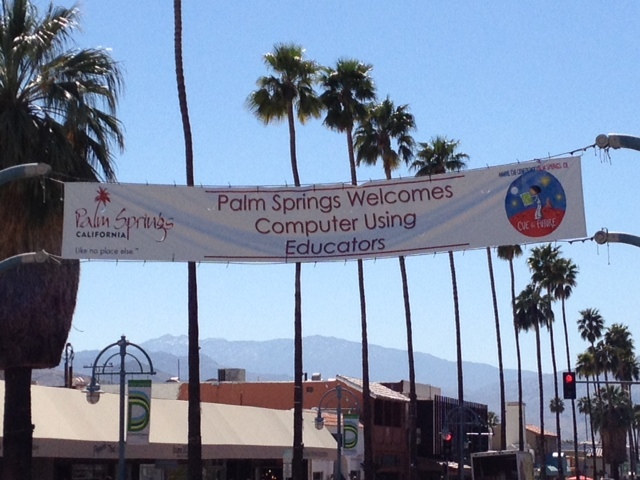 How ironic that the CUE conference is being held this week at the Palm Springs Convention center. Marco Torres is a teacher/technology director/professional filmmaker in LA who has had success using technology to empower minority students. Diane Ravitch is a history of education professor in New York who has written recently about the crumbling of education. She is also an outspoken critic of NCLB and charter schools, and a vehement supporter of teachers. I won’t be attending any of these – how odd. These keynotes are very temping….. but vacation is vacation! Yup. And we still do it.